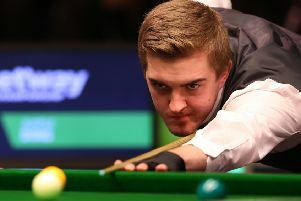 Capital snooker player Ross Vallance ended Robert Carlisle’s winning run to reach the final of Scottish Main Tour Event 4 and put a stop to Carlisle’s pursuit of three Scottish titles in succession. Vallance opened up with a 3-2 victory over fellow Edinburgh potter Lee Mein, winning the final frame. He then clean-sweeped Cumbernauld’s Davie Hutchison to reach the quarter-finals. He followed it up with a 3-1 victory over Falkirk’s Barry Wraith before overcoming Carlisle 3-2 to reach the final.